Greg Grainger Adventure Tours offers this unique ancient Persia to modern Iran journey that will make the traveller in you learn about the ancient treasures of Persia and understand the Iran of today. This exploration will take you to a handful of very memorable and culture-rich places such as the Esfahan, which is home of he most majestic collection of buildings in the Islamic world. Included in the list is the ruins of Persepolis, which is considered as world-class heritage. The desert oasis of Garmeh is where you could experience real Iranian hospitality. Marvel at the soaring minarets and blue tiled domes of Yazd. 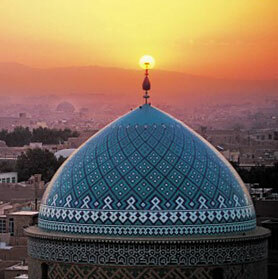 Gaze upon the Blue Mosque and explore the UNESCO-listed Bazaar of Tabriz. We will also travel to Shiraz which is the heartland of Persian culture and one of the most important cities of Islamic history. This 15-day comprehensive journey will be all the more exciting as participants will stay in comfort and luxury in a 5-star Abassi Hotel in Esfahan. Imagine basking to this unique and mystifying journey as you untangle the country’s secrets and grandeur. This middle eastern journey will be a very interactive experience as you will have a truly fantastic time walking with the people, visiting their homes, talking to mullahs and hearing from people in the bazaars. Iran is truly an enchanting city just waiting for you to explore it. Come with us on a tour of a lifetime. Don’t just take a break, have a real adventure!